Dog breeding, or the process of mating selected dogs for certain qualities and characteristics, has become more specialized over the years, with different types of breeds particularly designed for different types of tasks. There are dogs bred for protection, hunting, assistants for the physically challenged, companions, etc. Doberman Pinscher – This breed originated in Germany and has been around since 1890. They are about 40 kilos (about 90 pounds), black and tan, and have their ears cropped and their tails docked (where it is still legal). They were bred with excellent traits for a guard dog, such as athleticism, strength, and obedience. However, Dobies are susceptible to health issues concerning most protection dogs, such as an inherited blood-clotting disorder called von Willebrands disease (vWD), or a serious heart disease called dilated cardiomyopathy. Some guard dogs develop a neck disease called “wobblers,” or cervical vertebral instability, while a few have hip dysplasia and prostatic disease. Dobies live for about 11 years. If trained properly, Dobies are very loyal and obedient companions. German Shepherd Dog (GSD) – The German Shepherd Dog (GSD) originated in – you guessed it – Germany, and was first bred in 1899 as a utilitarian working breed which was popularly used for herding sheep. During the World Wars, they were used on the field thanks to their keen sense of smell, which made them perfect in landmine detection or enemy tracking. They’re the most common breed used by the police force today, due to their strength, intelligence, versatility and obedience. The GSD is particularly intelligent; they’re very fast learners and very good listeners. 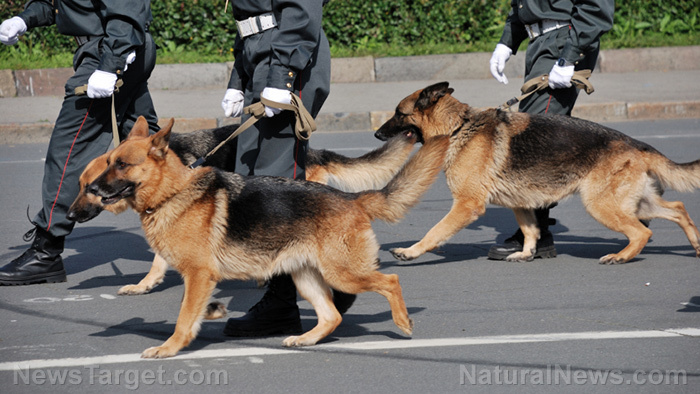 The GSD is often the preferred breed for many types of work, especially as a protection dog; they are aware of their surroundings and do an excellent job of protecting their homes and owners. Great Dane – Also known as the German Mastiff, the Great Dane is one of the tallest breeds around. They are big and intimidating, but are very gentle in nature, excellent around children or even other animals. Moreover, they are aware of their size and won’t run around the house. They are timid and may run away from a confrontation, but their bark is powerful and intimidating enough to fend off would-be intruders, which makes them excellent guard dogs. Rottweiler – A rather old breed, the Rotties were used by the Romans as attack and guard dogs. They originated in Germany where they were used to drive cattle and pull carts for farmers and butchers. They are overly-protective dogs, and can be ferocious in their defense. Without professional training, this breed can be too much for some people, and can even be a threat to children. However, they are some of the smartest breeds around, so with careful training and socializing, you will gain an extremely loving and friendly dog. Saint Bernard – This massive breed became a household name thanks to the movie Beethoven, but these dogs have been around for far longer than that. They are known to rescue travelers from the bitter cold winds of the Alps – if you think of a Saint Bernard, you will most probably picture a huge, furry dog with a flask attached to its collar. They are giant, muscular dogs, able to grow to about 180 pounds. Despite their size, they are gentle, intelligent, and are all around good-natured dogs, making them excellent pets for families with children. Like Great Danes, they have powerful barks but not much fight in them. However, unlike Great Danes, they are not at all aware of their size, and may trample on small children by accident if left unsupervised. There are many breeds of dogs to choose from. Choose yours with help from a specialist on the kind of dog that would suit you most. Consider your type of home, number of family members, and overall living conditions when choosing your next best friend. You can check more stories about pets and their needs at PetHealthDaily.com.